By Guest Bloggers Hannah, Emily and Alyssa Tagle and their future stepmom, Gabrielle Reichert. Hannah is 10 years old and likes math, Legos, Minecraft and reading; Emily is 13 and loves to draw and write; Alyssa is also 13, and she loves science and cheerleading. They and Gabrielle live with their father, Dan, in the 40 Acres neighborhood of Wilmington. In The Wizard of Oz, Dorothy runs away because she is about to lose her dog Toto. She wanted to be far from home but instead gets caught up in a twister. She wakes up in Oz with Glinda the Good Witch. The only way Dorothy can get home is to follow the yellow brick road. Along the way, she meets the Scarecrow, the Tin Man and the Lion. They all help her find her way to see the Wizard of Oz. Once they meet the Wizard, he agrees to grant their wishes but first they must bring back the broomstick from the Witch of the West. Unfortunately, they are captured by the Witch's evil monkeys so the Witch can figure out how to take the ruby slippers off of Dorothy’s feet. Dorothy is saved by her friends the Scarecrow, the Tin Man and the Lion, but the Witch finds them and sets fire to the Scarecrow. Dorothy throws a bucket of water at her, not realizing that the Witch will melt. Everyone cheers! Dorothy and her friends take the broomstick back to Emerald City, and the Wizard grants all of their wishes, including sending Dorothy back home to Kansas. But unfortunately, the hot air balloon he has to take Dorothy home floats away without her. Glinda returns to tell her she can still return home by using the ruby slippers. Dorothy wakes up back in Kansas with her family and Toto. I think the most beautiful costume was the Good Witch – it was so sparkly! My favorite actor was Toto. And I really liked the song Off to See the Wizard. But, I didn’t like the high-pitched screaming of the Witch and the monkeys. I would recommend it to other kids my age. The singing and dancing was amazing. And the ruby slippers were bright, red and sparkly. The Wizard of Oz is my second play I’ve seen and it might be my favorite! 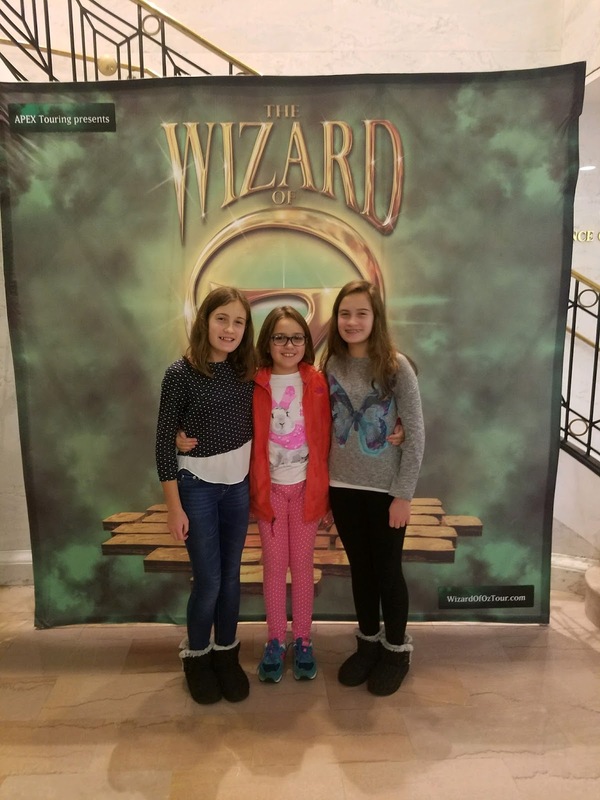 On Tuesday, November 14, 2017 I went to The Playhouse on Rodney Square to see The Wizard of Oz. I liked the dancing because everybody was included in the choreography. I did not like how the actor, Emily Perzan, was so loud as the Wicked Witch of the West, but it was cool that she could play the role so well. Victor Legarreta, who played the Lion and Zeke, stole the show, as always. He did an amazing job. My least favorite part was when the boy munchkins and the jitterbugs came out. I did not like their costumes. But overall, the costumes for the rest of the performance were amazing. You forget they were actors on stage and really came together to tell the story to the audience. My favorite song was Over the Rainbow. Dorothy, (played by Kalie Kamann) did an outstanding job with her role in every scene. I would definitely suggest this play to others but maybe not little kids (age 7 and under). The show started at 7:30 but didn’t end until 10:30 (which was past even my bedtime on a school night). In all, it was a fantastic show! The play The Wizard of Oz is a wonderful play. I saw it opening night and it was fun, happy and joyful. Dorothy (Kalie Kaimann) is a wonderful singer and actress. Her dog Murphy (aka Toto) stole the show with his overload of cuteness! In the beginning, Dorothy and Toto are just playing and then Miss Gulch (Emily Perzan) wants to take Toto away. Dorothy tries to run away, but Professor Marvel (Kirk Lawrence) tells Dorothy that Auntie Em (Ashleigh Thompson) is sick (but she isn’t). Dorothy runs home just in time to get inside before the twister hits. She falls asleep and before she knows it, she’s meeting Glinda the Good Witch (Ashleigh Thompson) and the munchkins in MunchkinLand! One thing I did not like was how loud it was from the Wicked Witch, the munchkins and the monkeys. I had to cover my ears! 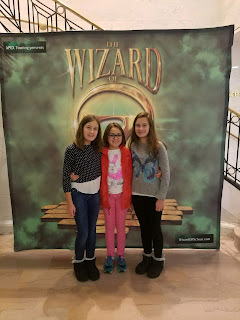 I can’t remember the last time I watched The Wizard of Oz, so I was excited to see the performance. The set design was incredible, really felt like you were part of the story. The mix of back screen, stage and front screen gave life to each act. The munchkin flowers were incredibly detailed and very vibrant. And I loved the winged monkeys – not so scary in this performance! Of course the Lion stole the show, but a close second was Toto...Adorable and so well-behaved! The only thing I didn’t like was how long the show ran. Three hours even with teenagers is tough, let alone the little ones. While the first half was strong, I felt like there was ‘filler’ in the second. The dance in Emerald City (without any of the main characters) I felt was long and unnecessary, as was the Jitterbug. But the singing, costumes and actors were fantastic. I would recommend this show for your families, but you might want to keep the littler ones at home.